In a past post, we presented writing about family artifacts as a “way in” to your family history. Curiosity about your family heirlooms as well as your ancestors’ everyday objects can lead you to a time past and inspire meaningful writing to add to your family scrapbooks, histories, and websites. When a particular family artifact ‘speaks’ to you, listen and start writing your ‘way in’ to the past. In this post, we present several exercises to help you move from brainstorming and research to drafting a descriptive vignette featuring an artifact. A descriptive vignette is a scene in which sensory detail brings the moment, the person, and, in this case, the artifact, alive. A narrative vignette, on the other hand, shows conflict, tension, and resolution, and has a beginning, middle and end. Vignette writing provides practice in selecting specific, concrete details and figurative phrases to engage your readers, and this has merit in itself. However, the hidden value in writing about family artifacts is the promise of reaching new, more significant understandings—about the stories beneath the surface, your ancestors’ everyday life worlds, and your own experiences. When a particular family artifact “speaks” to you, listen and start writing your “way in” to the past. In this exercise, you will generate specific, descriptive details and figurative sensory imagery about your artifact. You might not use all of these descriptive words and phrases in your vignette, but they will help you connect to the artifact and generate the language essential to creating an effective vignette. Let your imagination run wild here; you can always tame and shape your phrasing later. The point is to find expressive language to bring your artifact to life for your readers. To begin, create a three-column chart like the one below to help you organize your sensory details. In the row for each sense, describe how your artifact looks, sounds, feels, smells, and tastes. In the “Figurative Phrasing” column, use imagery, similes, metaphors, allusions, personification, or other figurative language to describe your artifact. Feel free to write yourself related notes and questions as they come to mind in either column. As always, don’t worry about doing this exercise the right way; just capture the words and phrases that come to mind. If you feel stuck and want to get your creative juices flowing before brainstorming your sensory details, try free-writing your scene first. Use the prompts in the chart below to help you visualize your scene and the people in it. Don’t worry about responding to all of them–a little brainstorming and research goes a long way. Jot your thoughts down as they come to you, and when you feel you have enough, start free writing a first draft of your descriptive vignette. Where is the artifact geographically? What is your subject doing with the artifact? What year is it? Is your subject trying to accomplish anything? What time of year? What is your subject wearing? Where is it placed or kept? What is your subject's facial expression? Where did it come from? What gestures does your subject make? Whose artifact is it? What does your subject hear? Smell? What does it mean to the person to whom it belongs? How does the air feel? What concrete or sensory details can pull you from other exercises to include here? What thoughts are going through your subject's head? What emotions is your subject feeling? Do these thoughts and emotions relate to the artifact? Is anyone else in the scene? Who? Doing what? A note on truth in non-fiction writing: In general, stick as closely to the known facts as you can and keep a list of research questions going to make sure you take the time to verify the material you think is fact if you plan to use it in your family history. As essayist Phillip Lopate advises in To Show and to Tell, as creative nonfiction writers, we should be “(h)onest to the world of facts outside ourselves, honest in reporting what we actually felt and did, and finally, honest about our own confusions and doubts.”1Phillip Lopate, To Show and To Tell: The Craft of Literary Nonfiction. (Free Press, 2014), 13. He further adds, “there is something magical and uncanny about the world as given to us.”2Ibid., 14. Since we are hoping to preserve what is “magical and uncanny” in our own family histories, we don’t want to give our readers any reason to doubt our veracity. Conversely, I have found allowing my imagination to take over helps me connect more deeply with the person or events I am writing about. It even helps me figure out where I need to focus my research to accurately complete a piece. So I advocate for this creative writing strategy when brainstorming and free writing–but always with the expectation that in the final piece, I will edit for honesty, truth, and conjecture. Whenever you enter the land of speculation or write a scene that is the composite of many similar scenes, you should make it clear to the reader you are in the realm between fiction and nonfiction. Now, place your artifact in a specific time and place in your ancestor or family member’s life. The scene can depict an everyday scene (a “slice-of-life”) or a special occasion. It can be imagined, researched, and/or remembered. Once you can picture it, start writing to capture it. Your goal is to write a short vignette capturing the artifact in its original environment – or, if you prefer, a time period of your choosing. For example, maybe the first time you became aware of an heirloom occurred when your grandmother explained its origin and what it meant to her. When you start writing your piece, don’t feel you must start at the beginning. Jump in where you can, and then shape your work as you write. 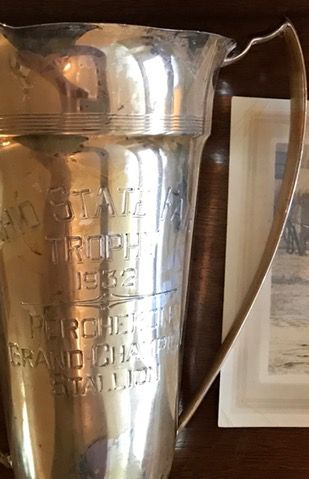 The first time I saw my grandfather’s 1932 Ohio State Fair Percheron Grand Champion Stallion Trophy in May 2016, I could barely read the lettering under the cool, yellow tarnished silverplate, and its black plastic base dangled from a poorly soldered thread. To the unknowing eye, the trophy might seem an old, worn piece of tin, headed to the trash, but raised on our family stories and artifacts, I saw a man and horse united in purpose and spirit on their journey to greatness, captured in a moment in time that would never come around again. The trophy’s simple, Art Deco-inspired lines and narrow wing-shaped handles extending from the base of the vessel’s body to above the lip seem fitting for an elegant, but hard-working draft horse and his practical horse breeder owner. Yet, the trophy weighs no more than a can of pinto beans and the thin metal silver-plating reflects its Depression-era origins. Above the lettering, the trophy’s dinged lip gracefully flutes out from its rim which is circled by five narrow, closely etched lines to separate it from the main body of the vessel. When I stuck my nose inside the trophy to further examine the interior’s lack of silverplate, I could smell the trophy’s 84 dusty years. However, this trophy is no trivial symbol of achievement from a long-gone era. When Otho H. Pollock and his Percheron stallion, Sylaet won the Ohio State Fair Percheron Grand Champion Stallion trophy on that September day in 1932, it was the first in a trifecta of his major wins with Sylaet that fall. 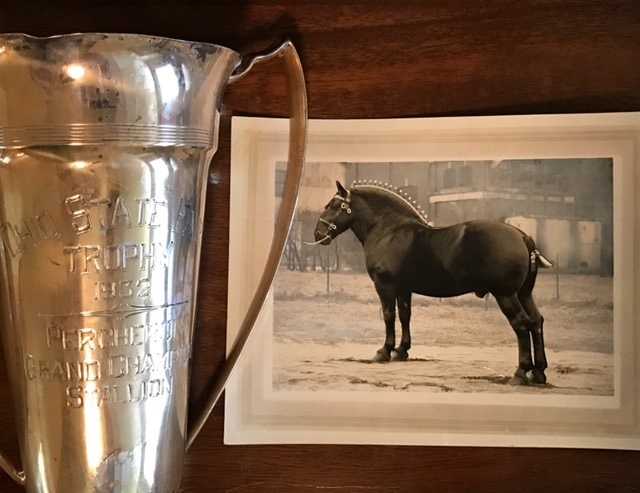 Like the original Olympic urns containing sacred oil, this trophy reflects something much greater than the winner’s singular triumph in one moment: the fruition of my grandfather’s twenty years dedicated to advancing the Percheron breed in Ohio and his deep connection with the horse he had been waiting for most of his 42 years. • Include your vignette in the introduction to a personal essay about what the artifact means to you. Your concrete details and descriptive imagery will draw your reader into your personal thoughts. • Use your vignette as a sidebar in your family history. • String together a series of descriptive vignettes related to the artifact. • Use vignettes inside an essay to illustrate a theme connecting your artifacts. • If the artifact has passed through many hands, use a series of vignettes to tell the story of its journey in a narrative essay. • Combine vignettes and images of your important artifacts in a digital or print notebook. • Use the specific, concrete detail and imagery you generated for your vignette to interject energy into your biographical essays, personal essays, memoirs, and narratives. As always, please don’t hesitate to share your own ideas below in the comments! 1. ↑ Phillip Lopate, To Show and To Tell: The Craft of Literary Nonfiction. (Free Press, 2014), 13.